Tyrel may immediately draw comparisons to Get Out for its initial premise of an African American finding himself in an awkward situation during a weekend getaway surrounded by white people. But where Sebastian Silva’s Sundance flick differs from Jordan Peele’s Oscar-nominated movie is that Tyrel exists without hypnosis or the sunken place. It doesn’t pack the overt racial punch in the gut that Get Out had, but Tyrel provides a nuanced exploration of human behavior and cultural differences that is delivered with a harrowing sense of reality. Jason Mitchell (The Chi, Mudbound, Straight Outta Compton) stars as Tyler, who is in need of a break from the hustle and bustle of New York City after his girlfriend’s family takes over their apartment. 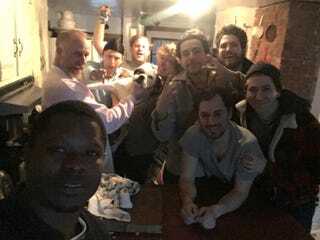 His friend Johnny (Christopher Abbott) suggests that he hang out with him and his buddies in their Catskills, N.Y., cabin to celebrate the birthday of Pete (Caleb Landry Jones). What appears to be an all-male affair where the bros can indulge in alcohol and conversation slowly devolves into something that Tyler isn’t familiar with. And from unfamiliarity emerges an uncomfortable environment and, eventually, paranoia. It’s important to note that the film’s title of Tyrel, while the protagonist’s name is Tyler, is no mistake and is indicative of the cultural misunderstandings that abound. During their first drunken night at the cabin, Tyler is swiftly sobered up by the collective raucous behavior, with Pete being the most grating and unnerving of the varied personalities. This phase of microaggression isn’t anything new for the group. But for Tyler, it’s foreign territory that doesn’t sit well with him. Rather than endear himself to the group, Tyler instead warms up to Cosmo, the family dog, and hides away from the crew behind his bond with the canine. Eventually, Tyler feigns fatigue and retreats to bed, but Johnny notices that his friend is acting oddly and calls him out for being a party pooper the following morning. It’s hard for Tyler to decide if his discomfort is racial, cultural or just a simple case of struggling to be social. But, ultimately, he realizes that this just isn’t a crowd he can relate to, and it results in his making some irrational decisions as the weekend drags on. While Silva’s film handles this situation very naturally, it lacks the punch of Get Out and opts to stew in its own despondence throughout the 86-minute runtime. It occasionally drags without anything of consequence taking place as the group’s antics swallow up a majority of the screen time. And we don’t really learn much about the partygoers or why they are the way they are, which forces them into one-dimensional characters. You have the gay guy, the eccentric guy, the hard-nosed guy, etc. Names don’t really matter when you can identify them by their actions. What truly anchors the film is Mitchell’s performance. He masterfully puts together a character who is a passive and well-intentioned presence and tries his best not to ruin the fun with the uneasiness he feels toward the group. But as the film carries on, their shenanigans wear him down and cause him to question whether or not these actions are designed to unnerve him or if he’s just a little too paranoid about his surroundings. What Mitchell also does extraordinarily well is portray a man who unintentionally uses liquor as a truth serum of sorts. The more alcohol he consumes, the more comfortable he is with calling out their antics. His intoxication is believable as Mitchell handles the inner turmoil of Tyler with exceptional nuance. It all leads to a final act where everything comes to a head and leads Tyler to come to grips with his surroundings. The story doesn’t end neatly and seems to take a lot longer to get to the resolution than it actually does. However, it manages to be a tense, and not necessarily amusing, experience that will be digested differently depending on the viewing audience.